Start the game client on Steam. On the following screen, select the appropriate gamemode. You will only be able to find your server by clicking on the appropriate gamemode, which is determined by what scenario is being used. A server set to load a "Coop" scenerio map will only appear in the "Coop" server listings, and the same goes for "Versus" maps. Coop: This mode is any scenario with human players on one team, and AI bots on the opposing team. At this time, they include "Checkpoint Security" and "Checkpoint Insurgency". Versus: This mode is any scenarios with only live human players on both teams. 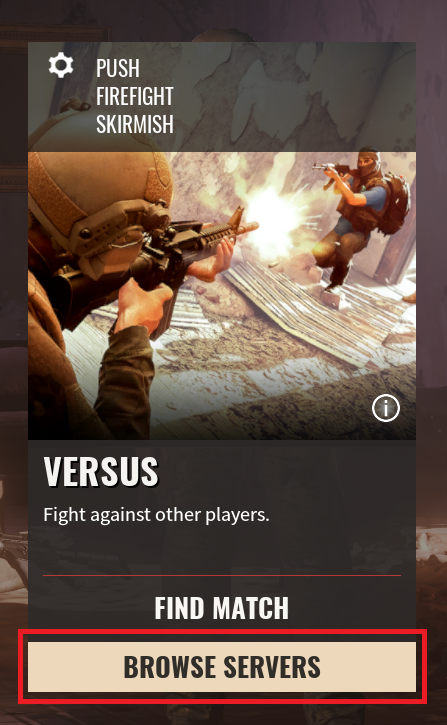 At this time, the Versus mode scenerios are "Push", "Firefight", and "Skirmish". 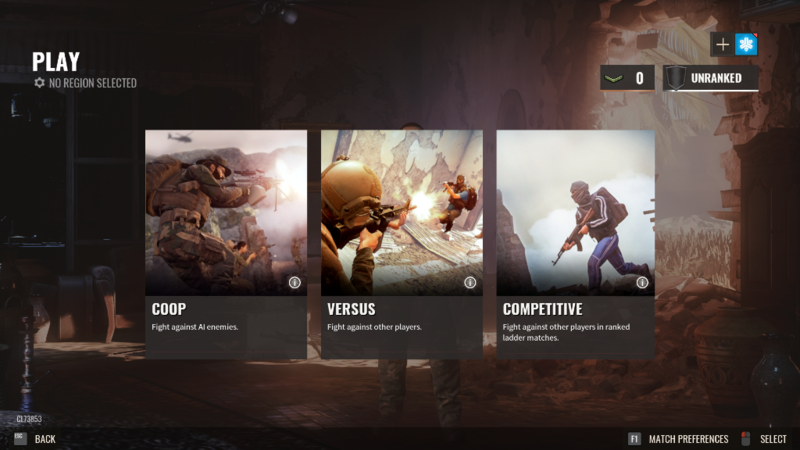 Competitive: There is also a "Competitive" mode for ranked matches, but the only options are online matchmaking, so you wi`ll apparently not be able to run this game mode on your private server. This game mode will most likely be restricted to official servers hosted directly by the company. To search for Coop mode servers, move your mouse over the coop box, and pop-up menu choices appear at the bottom of the box. Click "Browse Servers"
To find your "Versus" mode server, move your mouse over the Versus box, until you see pop-up menu choices appear at the bottom. Click "Browse Servers" to go to the server listings for "Versus" servers. Once you have clicked "Browse Servers" in either Coop or Versus mode, a listing of available servers appears. 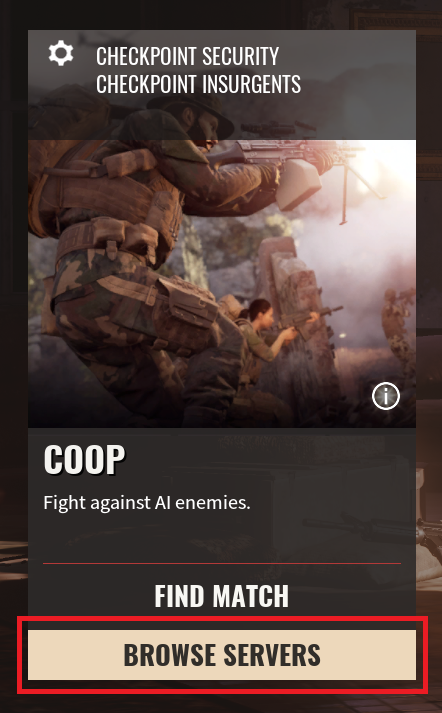 The picture above shows Coop servers, but the listing for Versus Servers is identical. Allow about 5 -10 seconds for the server listings to populate each time you open this screen. Clicking the headers "Server", "Players", "Map", "Mode", and "Ping" across the top of the listings will sort the server listings. For example, clicking "Ping" will sort it from lowest ping at top, to highest ping at bottom. Clicking it a second time will sort it the opposite way, with highest ping at top. Clicking "Server" header will sort all server names into alphabetical order. This is probably the fastest way to find your server in the listings. "Filters": Allow you to exclude empty or full servers by clicking the checkboxes. The plus sign at upper right corner allows you to invite other steam players to join your group. NOTE: If your server does not show in the listings, you may not be looking in the correct category (Coop or Versus). Once you find the correct server, click the "join" button at far right. If the server has a password, a pop-up window will require you to enter the password. If successful, you will see a loading screen for the scenario, with a percentage progress symbol in the lower right corner. Wait for the map to load. Once you have joined the game, you should see a view of the scenario map. if you click on "game" at the top of the window, you will see information about scenerio objectives, and you will also see options for the game, such as "Leave Game" and "Settings". If it's a "versus" match, you can also change your team by clicking on the selections in the upper right corner. The next step is to select a class, which will determine what weapons and loadouts your character will have access to in the game. The classes are listed on the left side. If the class has a "number/number" following it, the number on the right side of the slash is the maximum number of players that can select that class. The number on the left is the number of players who have already selected it. Riflemen only shows a single number, because an unlimited number of players can be "riflemen". After you select a class, you can edit the weapons and equipment your character will use in the match. Select your weapon, and weapon addons, and make any others changes to your gear. Once you are finished, click "Deploy" and you will enter the match! Good Luck!